TRNSMT Festival organisers DF Concerts have revealed the first wave of artists for the 2019 festival. This year's event runs from Fri 12–Sun 14 July at the Glasgow Green where Stormzy, Catfish and the Bottlemen, George Ezra, Gerry Cinnamon and Snow Patrol will take to the stage. 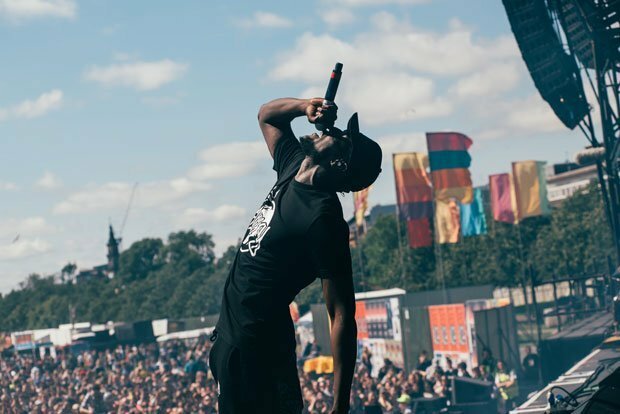 Single day tickets and weekend tickets go on sale at 9am on Fri 22 Feb.
Hip hop and grime artist Stormzy tops the bill, returning to the festival after his slot in 2017. The MOBO Award winner is hot property again this year, having been announced as one of the major headliners for Glastonbury festival. 2017's Gang Signs & Prayer may be his only album, but Stormzy has gained a strong fan following over the years. He has appeared on numerous mixtapes and singles for artists like Jorja Smith, Little Mix and Linkin Park. Catfish and the Bottlemen will perform at the festival fresh off the back of their short UK tour. The four-piece are to release their new album The Balance on Fri 26 Apr, giving TRNSMT attendees the chance to hear their latest material live. Lead single 'Longshot', came out earlier this year. The album is available for preorder now. Wonderboy George Ezra will no doubt perform hits like 'Shotgun', 'Paradise', 'Budapest' and 'Hold My Girl' at the weekend long event. The 25-year-old chart topping musician released his second album, Staying at Tamara's, last year. It will be his second time performing at the event. Making the announced artists are local lad Gerry Cinnamon and Irish rock band Snow Patrol. Cinnamon released debut Erratic Cinematic in 2017 featuring songs 'Belter' and 'Sometimes'. The Castlemilk-born singer will also be making his second appearance at the festival. Snow Patrol disappeared off the musical map for seven years before returning in 2018 with sixth studio album Wildness. Fans can expect to hear new material mixed in with classics like 'Chasing Cars'. 'Open Your Eyes', and 'Run'. TRNSMT runs from Fri 12–Sun 14 July at the Glasgow Green. Tickets are available at 9am on Fri 22 Feb.